Not wanting to be left behind in the wake of everybody getting in on the Haswell action, Lenovo has updated its top end Windows 8 powered IdeaPad Ultrabooks to include Intel's latest CPU. The Chinese laptop maker's latest U-series models, the U330 Touch and U430 Touch, will be offered with a 4th Generation Intel Core i7 processor, up to 8GB RAM and optional NVIDIA graphics with up to 2GB VRAM. They are set to replace the currently available U310 Touch and U410 Touch models. The U330 Touch will be found with a 13.3-inch display and the choice of a 1366x768 or 1920x1080 pixel resolution display, while the U430 Touch wil offer a 14-inch display and the same resolution options. Both models are available in multiple storage configurations, including a 1TB HDD with 16GB SSD, a 500GB SSD with an integrated 16GB NAND flash, or 256GB SSD. 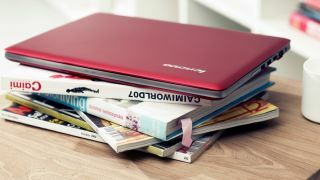 Lenovo has also updated its entry level S range to include 3rd Generation Intel Core i5 Ivy Bridge processors. That includes the 11-inch S210 Touch, the 14-inch S400 Touch and the 15.6-inch S500 Touch, which include i3 or i5 CPUs, up to 8GB of RAM and an optional touchscreen display. The IdeaPad S400 and S500 can be fitted with optional discrete graphics in the form of NVIDIA's AMD S400 (in the 400) or its S500 (in the 500). Samsung has billed the new models as available this summer, with the its U-range models starting at $799, and S-range variations starting at $500. No word yet on UK pricing.